12 STUDENT HANDBOOK and bed linen are furnished and are laundered regularly at no additional expense to the students. Each room is equipped with an individual chestdesk with study lamp, chair, beds, lavatory and telephone. Shower and toilet room are conveniently located. Room cleaning service is provided. All students have access to the Hillcrest Coffee Shop, the Quadrangle Cafeteria, and the Quadrangle Barber Shop. The residence hall radio station, KWAD, operates from the Quadrangle. Each residence is divided into houses or small units with an adviser for each unit. The adviser works with the unit officers, who are elected by the residents, and the social and activity programs for the unit are coordinated by the residence Activity Adviser and Athletic Adviser. Each men's residence has its own student governing organization, and the entire program is supervised by a Head Counselor. Women's Residence Halls- The residence halls for women include the four houses in Burge Hall- Clara Daley, Ruth Wardall, Maude McBroom, and Beth Wellman- and the Kate Daum House. Residents of these units are provided meals in the Burge Hall dining rooms. Currier hall and the new Carrie Stanley Hall make up another women's unit, and these residents eat in the Currier Hall dining rooms. These buildings offer similar facilities to those provided in the men's residences and student rooms offer the same amenities. There are individual study lounges on each floor in the women's residences. The residences are divided into "floors" as the basic living units, and each unit has its individual student governing body, and social and activity programs. A staff of advisers, composed of a Head Counselor and assistant, supplemented by floor and unit advisers, provides counseling for individuals and advisory services for group activities. All students have access to the food services in the Carnival Room in Burge Hall. University Married Student Housing In addition to providing residence halls for single students, the University has approximately 1,000 units for married students which include the Parklawn and Hawkeye Apartments - one and two bedroom units. - and the barracks-type apartments, which are temporary units with two bedrooms. Married students interested in such housing may apply to the Married Student Housing Assignment Office, 105 University Hall. The academic requirements for occupancy of these facilities is registration for nine or more hours of course work each semester. 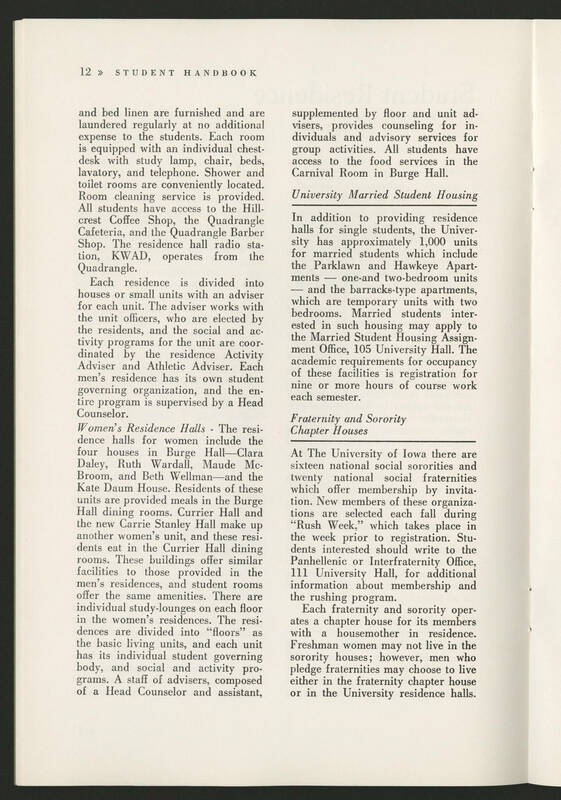 Fraternity and Sorority Chapter Houses At The University of Iowa there are sixteen national social sororities and twenty national social fraternities which offer membership by invitation. New members of these organizations are selected each fall during "Rush Week" which takes place in the week prior to registration. Students interested should write to the Panhellenic or Interfraternity Office, 111 University Hall, for additional information about membership and the rushing program. Each fraternity and sorority operates a chapter house for its members with a housemother in residence. Freshman women may not live in sorority houses; however, men who pledge fraternities may choose to live either in the fraternity chapter house or in the University residence halls.